Max came into my life on September 2, 2006, when he was given to us by a friend. He was my first cat and his amazingness set the standard for all other cats. He quickly settled into my home and lived a fun and enjoyable life. He was around 11 years old when he came to live with us. Max had been declawed when he was young. Two years after we acquired Max, he was diagnosed with early stage chronic renal failure (CRF). WIth the help of a special diet, various medicines and subcutaneous fluids, he lived another wonderful 9 months. He died on May 9, 2009. Max was a big kitty, before he was ill from CRF, he weighed a healthy 14 pounds. 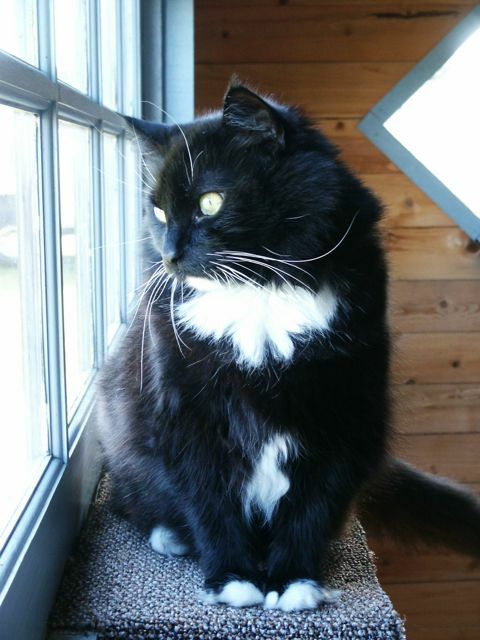 He was a gorgeous longhaired black and white tuxedo kitty. 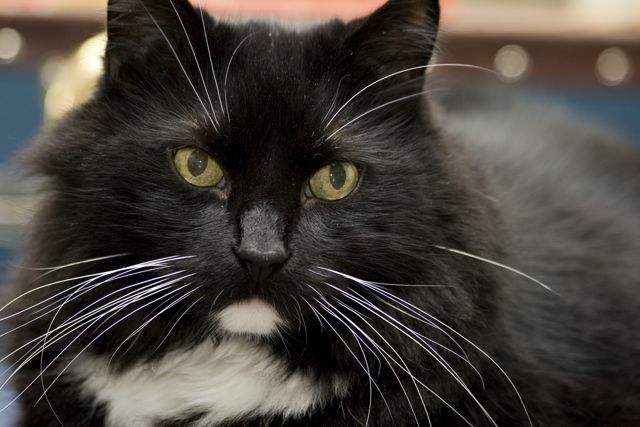 His sweet black face was highlighted by long striking white whiskers and his white chin. He had a white spot on his chest and two on his tummy. He was the original four white paws cat. Max loved to be held. He would frequently asked to be picked up and then wouldn't want to be put down! It wasn't uncommon for him to flip upside-down in my arms and fall sleep. When he wasn't lying in my arms he would be resting on one shoulder. He was very snuggly and always wanted to be touching his humans. He enjoyed being a lap cat or sleeping right up against his human. He also enjoyed watching birds from the windows or his perch on the front porch. In warmer weather, I would take out his harness and leash and he would coming running to me. He was eager to get outside and enjoy some yard-time. Once outside, he wanted to sniff everything and eat lots of grass! We went on many long walks exploring his yard. Most every night after all the humans went to bed, he played a wild game of yarn ball which involved yowling loudly, batting the yarn ball around, and running through the house. When he was done, he would come join his humans for sleep. Max enjoyed gazing into his human's eyes. He would maintain eye contact for long periods of time, it was as if he was looking into your soul and I was looking into his.